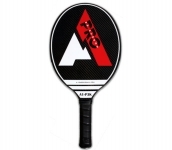 The A-1 Pro Series of paddles are finally here after over a year of painstaking research and development. They are available in 3 Hi Technology materials: Kevlar, 3k Carbon, and 3K Silver Braided Carbon. 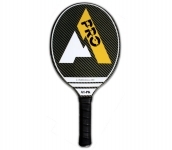 All three of the paddles have a special density core allowing for superb control and increased power. 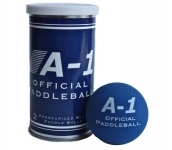 They are excellent if for playing "big-blue" paddleball and of course will withstand the impact associated with playing "small ball" paddleball. The handles are small, the same size as the A-1 Classic line of paddles that have been best sellers for over 7 years. 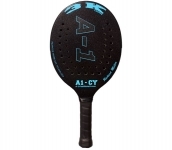 Unlike other lighter paddles on the market, the A-1 Pro paddles have an excellent hit regardless as to where the ball is struck on the paddle. The lack of holes provides for an amazing hit, edge to edge. 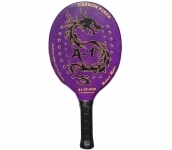 There is no vibration or weak spots on these paddles! They all weigh approximately 300g. (10.5oz.) and are perfectly balanced. 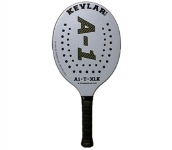 The thickness of the paddles is a bit thicker than the XL paddles which gives them superior stability and offers greater power considering they are so light. The difference between the there paddles is, of course, the look and hardness of the outer face material. The 3K Silver offers the greatest control as this one is the softest material as the balls springs off it. The Kevlar is the stiffest material as this is a favorite for the hard hitters but allows for superior control. The 3K Carbon is a blend of the Kevlar and 3K Silver offering the hardest hitters amazing power while still proving excellent control. 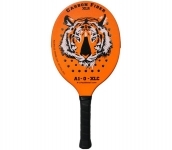 Regardless of the paddle that you choose, each should withstand the impact of even the hardest hitters in the game!